"Green shoots" are indications of stabilization, not signs that a roaring bull market is about to begin. First, a chart of the Shanghai Composite shows that the index has rallied through an intermediate term downtrend (solid line) and that market is in the process of a sideways consolidation. In fact, it could be argued that the Shanghai Composite is starting to form a wedge pattern (dotted lines). Depending on which way the pattern resolves itself, it could point to the future trajectory of Chinese growth. China is an enormous consumer of commodities. In this post (see Time to take some risk off the table), I pointed to the dismal behavior of commodity sensitive currencies as a sign for caution. Now, commodity sensitive currencies such as the Australian Dollar has rallied through its downtrend. A period of sideways consolidation is likely at this point. The Canadian Dollar, which is another commodity sensitive currency whose economy has greater leveraged to the American economy than the Australian economy, recently staged an upside breakout from a trading range. Commodity prices are also showing a tender green shoot, though that one is far more fragile. The CRB Index below shows that commodity prices have staged an upside breakout from a short-term downtrend (solid line), but the longer intermediate term downtrend (dotted line) remains intact. The liquidity weighted CRB Index is more heavily weighted towards the energy complex. A look at the equal-weighted CRB Index, called the Continuous Commodity Index or CCI, shows that the CCI has staged an upside breakout through the intermediate downtrend. The most likely scenario is that commodity prices undergo a period of sideways consolidation. To be sure, these "green shoots" are early signs of recovery which can easily be trampled. The strength in commodity prices may be a false start, as Izzy at FT Alphaville pointed out that it could be just more inventory accumulation and not the result of actual physical demand. My current framework for the analysis of the global outlook is to examine the Three Axis of Growth, namely the United States, Europe and China. For now, I believe that the message of the markets from China has changed from bearish to a fragile stabilization. No doubt the aforementioned markets will retrace some of their gains, but chances are good that the risks of a hard landing are receding. 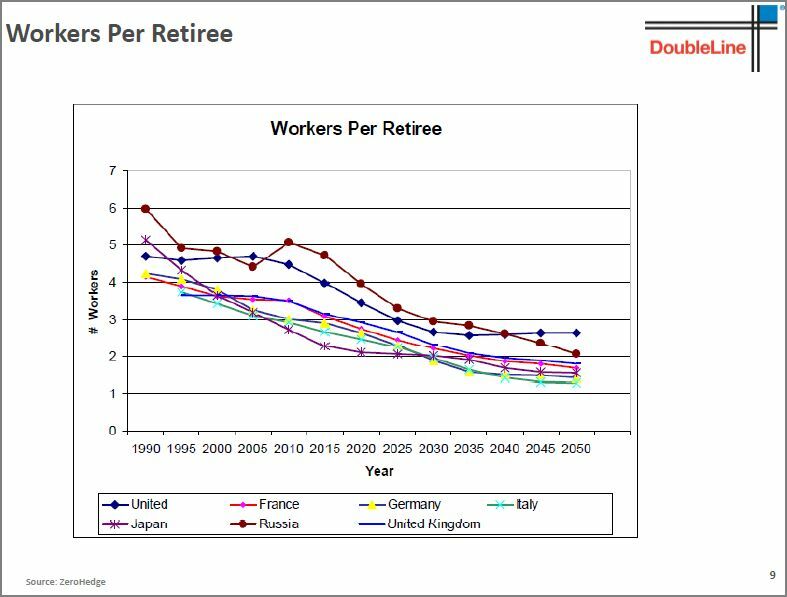 Structural reform, which is the European version of the step China took to "smash the iron rice bowl" in order to create labor flexibility for all, not just the young but all of the current employees in their cushy jobs and gold-plated pension plans. Draghi went on to characterize structural reform as the old days of the European social model being all gone. Now that austerity is starting to bite in many European countries, Draghi went before the European Parliament's Economic and Monetary Affairs Committee in Brussels and defended the Grand Plan. He went on to call structural reform a "growth compact". Restoring fiscal health is "an unavoidable policy measure to regain market confidence" Draghi said, stressing that governments need to "persevere." However, "to deny that fiscal consolidation has some short-term contractionary effects would not be correct," the ECB chief said, conceding later that these effects are now starting to "reverberate." Structural reforms are essential to restoring competitiveness but will also cause pain in the short term, the ECB president said. "Structural reforms hit vested interests," he said, adding that they "change profoundly the society." These changes are themselves "a source of pain," he added. "We are just in the middle of the river that we are crossing. The only answer to this is to persevere and for the ECB to create an environment that is as favourable for this as possible," Draghi said. He said competitiveness disparities within the Eurozone are a key underlying cause of the crisis and that "the way out is to implement structural reforms that free some of the energies." Chancellor Angela Merkel backed European Central Bank President Mario Draghi’s call to focus on spurring economic growth, as German officials rejected charges they are fixated on budget austerity to fight the debt crisis. Europe needs growth “in the way that Mario Draghi, the president of the European Central Bank, said it today, that is in the form of structural reforms,” the chancellor told a conference of her Christian Democratic bloc in Berlin today. Mr Hollande’s proposed growth plan would comprise four elements: the creation of commonly issued eurobonds “not for the mutualisation of debt but to finance” infrastructure, industrial investment and employment; additional financing of investment by the European Investment Bank, the bloc’s long-term lending arm; the imposition of a financial transaction tax by those EU member states willing to use it to find development projects; and the more efficient use of EU structural or regional development funds. In the days to come, there will a lot of theatre and inevitable compromises. The theatre will be entertaining, but don't forget that Hollande is committed to Europe and he doesn't want to go down in history as the one who blew up the EU. Expect him to compromise from his election rhetoric, but I would not be surprised if Merkel also compromised on the issue of eurobonds. So unless anti-Europe leaders take power, the eurozone is unlikely to fall apart. How serious is this selloff? Yesterday, global stock markets sold off mainly on the Hollande and Holland news. European stocks are in a well-defined one-month downtrend. US equities descended to test an important technical support level. However, when I look at the FX and bond markets, I can't see the same level of investor angst that seems to exist in the equity markets. For example, if Europe is such a mess, why is the EURUSD exchange rate holding up so well? Also consider the CADUSD exchange rate, which is sensitive to commodity prices and a measure of risk appetite. The loonie remains in a trading range relative to the greenback. There are no signs of panic in the bond market either. High yield, or junk, bonds continue to perform reasonably well in light of the difficulties experienced by the stock market. Why isn't risk aversion showing up in this market? In conclusion, until we get signs of a significant decline in risk appetite from the foreign exchange and bond markets, this bout of stock market weakness is just another phase in a sideways and choppy market. Now that we are nearly at support on the Spanish IBEX 35 Index, my inner trader tells me it's too early to be buying. We need to wait for more pain and panic to materialize. My inner investor says that signs of value are starting to show up in a number of natural resource sectors and it's time to start accumulating positions in resource cyclicals. To TMM [ed. TMM=Team Macro Man] it would appear that the only scenario that supports selling right now is one where Spain crashes, doesn't receive assistance, defaults and the euro and then Europe break up. Now call us picky but though that indeed is one potential outcome there are a lot of other scenarios and most of them involve some internal resolve, even if it does involve printing your amount of money. Elections may change the leaders of some countries but as the UK Con/Lib coalition is finding out, they are but the tip of the iceberg of the machine that is government. There is enough mass below the waterline that knows where its true interests lie to stymie any threats to them. Yes Minister indeed. Having piled back into equities last week the current mood should be considered as red flags to us and we really ought to run with the pack, chop the longs, swing short and whip up the doom. Instead though TMM have decided to do the reverse and have broken the glass on the cabinet containing their Kevlar Gloves and bought some Spanish stocks of international appearance ( braced for comments). Hold on tight !! Recall that my original premise for buying Spain is to wait for a period of maximum pain and panic (see How much more pain in Spain?). The defining moment was the 2009 lows, which would be a level of technical support for Spain's IBEX 35 Index. Now that we are nearly there, I don't think we've seen sufficient pain and panic in the markets for Spanish equities to be a contrarian buy yet. My inner trader thinks that TMM should be following his initial instincts to "run with the pack, chop the longs, swing short and whip up the doom." Consider this chart of European stocks, which exhibited a break of an uptrend, but the index is not showing any signs of panic yet. What about the euro? The EURUSD exchange rate is holding in nicely, thank you very much. So are 10-year Treasury yields. No signs of panic there either. Is the market about to hit an air pocket? I am starting to see the signs of a change in leadership. While my Asset Inflation-Deflation Trend Model remains in at a weak neutral reading and I am not in the business of anticipating model reading changes, my best wild-eyed guess for the stock market is a gut-wrenching correction, followed by an explosive rally as the Bernanke Put and Draghi Put kicks in. Consider the relative return charts below. The top chart shows the relative return of the Morgan Stanley Cyclical Index compared to the market. Cyclicals are underperforming and they have been in a relative downtrend after topping out in early February. By contrast, defensive sectors such as Consumer Staples and Utilities have been bottoming out relative to the market this year and recently started to outperform. These are the signs of a change in leadership pointing to a deeper correction in stocks. Alberta’s oil patch is roaring. Oil prices are flying, pipelines are pumping millions of barrels a day, and companies are engaged in a rollicking spending spree. Every 2½ weeks, companies shovel another billion dollars into oil sands projects. Drilling rigs across the province are tapping big new pools of oil. And firms desperate for skilled workers are scouring the globe to help them get on with ambitious growth plans. Western Canadian oil output is expected to surge by more than a third to 3.6 million barrels a day by 2018. Alberta’s energy frenzy has all the makings of a hollering rodeo party. But there’s one group conspicuously missing out on the action: investors. In the midst of a boot-stomping boom, oil and gas has been among the country’s worst-performing sectors of the stock market. Since the global economic crisis, benchmark oil prices have soared from below $40 (U.S.) a barrel to above $100. Many Canadian energy stocks, however, have been left in the dust. Indeed, this chart of the XOI, or Amex Oil Index, against the price of WTI shows that energy stocks are historically cheap against oil. Arguably, the graph doesn't show the true picture as XOI is shown against WTI, which has been trading at a discount to Brent, which is becoming the de facto benchmark for the world price of oil. We see a similar picture with gold mining stocks. The Amex Gold Bugs Index, or HUI, is trading at a huge relative discount to gold bullion and the relative relationship is approaching the post-Lehman Crisis panic liquidation and capitulation lows. The slope of the recent price action of the energy stock/oil and gold stock/gold ratio, however, tell the story of controlled selling rather than the panic selling that characterize a capitulation low. That's the same picture that I see in the IBEX 35, the Euro STOXX 50, Treasury bond yields and the EURUSD exchange rate. Longer term, however, I expect that asset prices to be well-supported by the Bernanke Put and Draghi Put. Consider the Italian MIB Index as a bellwether of market fortunes. While there is downside risk, tail risk is likely to be mitigated by the Draghi Put and the near-by presence of major technical support that stretch back to the mid 1990's. As the table below shows, this week is a big week for Spanish equity market, as most of the Spanish banks are expected to report earnings. Bad news could provide a catalyst for another downleg, which would be a set up for the good contrarian to start buying. In summary, my inner trader tells me that there isn't enough panic here for him to step up to buy, but my inner investor, who has a longer time horizon, tells me that it's time to start nibbling away at long positions in distressed sectors, such as Spain and resource stocks, at current levels. A couple fights and the neighbors hear every word. To outsiders, it sounds like the relationship is in shambles and on the verge of collapse. Insiders know that the couple have a long history together are deeply committed to the marriage. That's the story of the eurozone. An underlying assumption in my last post about buying Spain when the pain is at its worse is an underlying belief in mean-reversion. That is to say, the EU will not throw a major member state to the wolves. The principal political force is the commitment to the ideal of an integrated Europe, along with the huge investment of the elite in that project. This enormously important motivation is often underestimated by outsiders. While the eurozone is not a country, it is much more than a currency union. For Germany, much the most important member, the eurozone is the capstone of a process of integration with its neighbours that has helped bring stability and prosperity after the disasters of the first half of the 20th century. The stakes for important member countries are huge. Thus, the big idea that brings members together is that of their place within Europe and the world. The political elites of member states and much of their population continue to believe in the postwar agenda, if not as passionately as before. In more narrowly economic terms, few believe that currency flexibility would help. Many continue to believe that devaluations would merely generate higher inflation. If this were a mere marriage of convenience, a messy divorce would seem probable. But it is far more than such a marriage, even if it will remain far less than a federal union. Outsiders should not underestimate the strength of the will behind it. After the Second World War, Western Europe surveyed the wreckage and collectively decided "never again". In the 200 years preceding that war, Europe had been wracked by conflict (WW II, WW I, Franco-Prussian War, Napoleonic Wars) and the main source of conflict was between France and Germany, or the Germanic states before their unification. When Western Europe said "never again", they devised a solution that bound the French and the Germans so tightly that the devastation of war on the European Continent would be stifled, hopefully forever. That solution was the EC, which became the EEC and now the EU. Politically, they have largely succeeded. Today, if Angela Merkel mobilized the Bundeswehr and told the troops, "We are going to war against the French", the men would all laugh and go home. Compare that result to the cost of the Battle of Verdun of 300K dead and another 500K+ wounded and you will start to understand why the EU was formed. To say that the euro is at an end as a common currency is overly simplistic analysis. In many ways, the EU was paid by blood - just remember the price paid at Stalingrad, Verdun and Napoleon's retreat from Moscow, just as some examples. The most likely outcome – though far from a certainty – is compromise between Germanic ideas and a messy European reality. The support for countries in difficulty will grow. German inflation will rise and its external surpluses fall. Adjustment will occur. The marriage will be far too miserable. But it can endure. For investors, the survival of the European Experiment and the eurozone means that the eurocrats will eventually take steps to take tail-risk off the table, just as the ECB did with LTRO. That's why I believe in buying Spanish equities and banks at the point of maximum pain in anticipation of a rebound. How much more pain in Spain? Consider the recent history of the eurozone. Despite the dire headlines, the eurocrats were able to avert a catastrophe in 2011. Take the case of Italy, which was considered to be too big to fail but too big to save. A look at the MIB Index, which represents a broad index of Italian stocks, show that the MIB plunged and tested the technical support level offered by the lows in 2008 2009 - and support held. If you were to believe that the eurocrats have a Grand Plan for Europe (and there seems to be convincing evidence that there is one), then the most likely scenario is the northern Europeans hold peripheral country governments' feet to the fire in order to enact Grand Plan reforms, e.g. Spain plans to strip regions of powers in bid to calm markets. Were a real financial crisis were to hit, however, the authorities (e.g. the Troika) would come to the rescue and take steps to kick the can down the road a little bit more. This would suggest a highly speculative trading strategy. Wait for the the IBEX Index, which represents Spanish stocks, to test its 2008 2009 lows - and then buy and wait for the cavalry to come over the hill. Currently, IBEX has taken out its 2011 lows, but has not yet tested its 2008 2009 lows. Should such a test occur, the risk/reward ratio would likely be favorable enough to put on this highly speculative trade. For North American based investors, there is a Spanish market ETF available (EWP). Banco Santander (STD) is also US-listed. If I am right, then there isn't very much downside to European equities. If Dalio is right and the European authorities "have to act in a much more of a hurry than they previously believed", then the crisis will be upon us sooner than anyone expects. In that case, maybe we should getting ready to buy in May? Warning: Such a trade is highly risky and anyone who enters into it should size their positions carefully in accordance with their own risk tolerances (which may mean a zero position). If you were to put on such a trade, I would suggest that you enter a stop loss at 5-15% below your entry point in order to limit your downside. The risk/reward ratio should be favorable, but in this case, we would be playing the odds and the upside potential, though considerable, is highly uncertain. Have US equities seen an intermediate term top? It was a rough week for stocks last week, but I believe that we are due for an oversold relief rally. We will need to watch how the market behaves in the next couple of weeks in order to truly determine whether an intermediate term top is in. As the chart below shows, the market briefly tested the 50-day moving average and managed to rally above that support level and the longer term uptrend remains intact. The market is certainly oversold, as shown by my favorite overbought/oversold indicator. 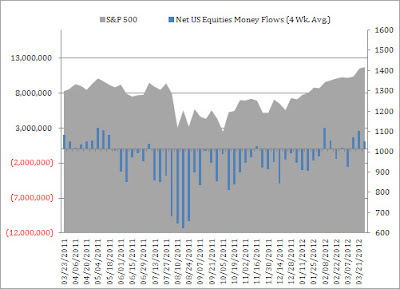 You would be forgiven for imagining that investors are allergic to owning stocks, given the data surrounding equity fund flows. For the last 12 months, as shown in Chart 4, below, investors have demonstrated at best a grudging affection for stocks. These are typically not the kind of levels of sentiment indicator readings that mark the start of a major decline. The NFP release a statistical blip? As well, the latest data shows March witholding tax collections continues to be strong, which all point to continued strength in employment. Gallup also reported that Americans' Spending Up Sharply in March, indicating that American consumer strength appears to be unrelenting. Based on the analysis so far, one may be inclined to give the bulls the benefit of the doubt, but inter-market analysis reveals a far more bearish tone. There are a number of worrisome negative divergences that shouldn't be ignored. For one, eurozone concerns are rising and the risk of financial contagion from Europe is rearing its ugly head again. European stocks have violated their uptrend and they have rolled over. The STOXX 600 Index, shown below, is now approaching the first technical support at the 61.8% Fibonacci retracement level. In addition, commodity prices look punk. The relative performance of the Morgan Stanley Cyclical Index is also following the pattern of commodity prices. If we are truly seeing a recovery in the American economy, shouldn't cyclical stocks be outperforming? In summary, we have trouble in Europe, weakening cyclicals and commodities. Do these look like the ingredients for a sustainable advance? Today, what we have right now is an oversold market that is due for a relief rally of at least 1-2 weeks in duration. In the meantime, Earnings Season is upon us with the possibility of margin compression weighing down the market (see my post Bad news is good news, good news is...). I am watching earnings reports carefully for whether margin compression is occurring this quarter, as I have to allow for the possibility that it may be pushed out to the next quarter's earnings reports. Earnings and forward guidance: Are margins compressing now or next quarter? Market leadership: How are the cyclicals and commodities behaving? European news, as we have elections in France and Greece coming up soon and the fear of European contagion could rise. Stay long, but keep tight trailing stops in place. Back when Mack started as a bond trader at Morgan Stanley, in 1972, things were a little different. “There were only 350 people,” he says. “They had $6 million in capital. Any time we priced a deal, every partner at the firm came to the meeting.” is first brush with disaster came during the 1987 stock-market crash. The key quote is every partner came to the meeting when they priced the deal because the partners' money was on the line. Do you think that today's Morgan Stanley behaves in the same way when the senior directors are playing with Other Peoples' Money? I see two problem in the structure of today's financial services firms. First, rewards are asymmetric. Today, if they win, bankers make out like bandits, but if they lose, someone else takes the hit. If a partnership investment bank loses, the partners lose their houses, their cars, their kids education, etc. That kind of double-edged incentive system makes people far more sensitive about risk control. When Chesley Sullenberger landed Flight 1549 in the Hudson, he was hailed as a hero, but bringing the plane down and getting the passengers off safely was a team effort. Co-pilot Jeffery Skiles somehow had completed restart attempts on both engines and was also able to run through most of the procedures to ditch the airplane — “something [the crash investigators] found difficult to replicate in simulation.” And the flight attendants (Shelia Dail, Donna Dent, and Doreen Welsh) ensured that 150 people were able to get out of the two of four exits that were viable, within three minutes. As anyone who has spent time around investment stars knows, the kind of culture that is created to support them usually doesn’t lend itself very well to the investment equivalent of landing in the Hudson. Instead, the environment can be much like that which Gawande has seen in operating rooms, where a head surgeon rules the day and is rarely challenged. Few are willing to speak up, leading to “a kind of a silent disengagement, the consequence of specialized technicians sticking narrowly to their domains. ‘That’s not my problem’ is possibly the worst thing people can think,” but it happens all the time (even in the investment world where people tend to be smart and opinionated). I wholeheartedly agree with that characterization. Early in my career, I personally witnessed a "star" investment banker who was allowed to run wild blow up a major investment bank, much to the detriment of his partners. The star system isn’t universal in the business, but it is dominant. And often one of the stars is also given the title of chief investment officer at some point along the way, a further acknowledgment of their track record — and a position for which most are wholly unprepared. Oh, the part of it where they are supposed to opine about the market? That they can do and do well. But the real work, of creating an organization that builds on an array of talent and a confluence of ideas to meet the needs of clients? Not so much. 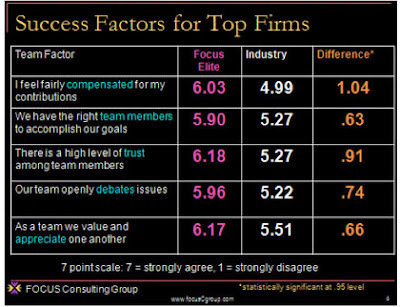 Success if predicated on teamwork, built on trust and the right incentive structures. In investment banking, that also means creating the right incentive structures, not only to make money for the bankers, but to put the right risk controls in place so that society doesn't bear the cost of failures. Dare I say it? In investment management and banking, it does take a village to succeed. 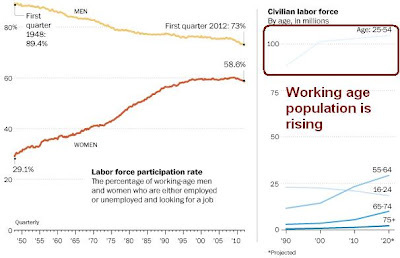 Do demographics point to slower growth and slower recoveries? Sometimes you have to go beyond the headlines to get the real story. Here's an example. If demography is destiny, the U.S. economy may be in the midst of a decades-long slowdown. The U.S. labor force is growing at about half the rate it was 20 years ago; according to recent projections by the Bureau of Labor Statistics, it will continue to expand at a slightly lower pace through 2020. Slower growth in the number of workers tends to hold back gross domestic product and employment, economists say. And that makes it less likely that the economy will pick up steam at the rate it did in previous recessions. These changes in the labor force “imply that future recessions will be deeper, and will have slower recoveries, than historically has been the case,” according to a paper issued last month by James H. Stock of Harvard University and Mark W. Watson of Princeton University. 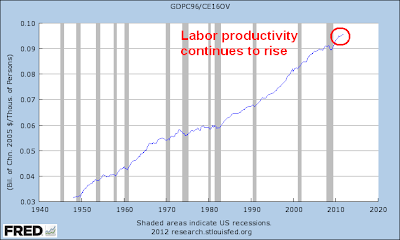 Their research shows that as much as half of the relative slowness of the recent recovery may be attributable to the fact that the growth of the U.S. labor force has declined. The demographic problem the US faces is the ratio of old to young, i.e. there aren't enough young workers to support retirees (Baby Boomers) as they age. 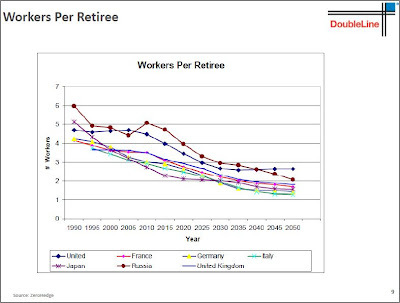 However, this chart from Rob Gundlach shows that the US is in better shape than many other industrialized countries. Sometimes you have to look beyond the headlines to get the real story. Michael Pettis has a must-read piece on the long-term growth trajectory for China, in which he says that China will inevitably change its growth pattern, either voluntarily or otherwise. Pettis contends that China will rebalance by shifting away from investment driven growth to a growth model based on domestic consumption. He went on to outline the pros and cons of each policy option, which is well worth reading in detail. This month, we begin the first of a three part series examining the effects of this deleveraging process as it affects the three major trade blocs, in the world, namely China, Europe and the United States. We discuss the challenges that affect each Axis of Growth and the likely growth trajectory that each region will have over the next ten years. Our analysis begins with China. China faces three challenges over the next ten years. Most immediate is the excessive debt built up from white elephant infrastructure projects on the government side, and a property bubble on the private side. 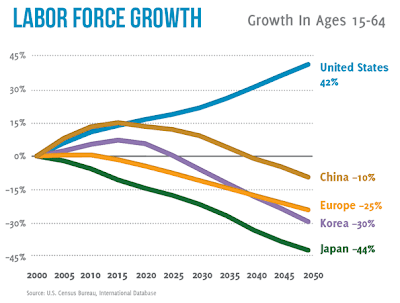 Longer term, China is facing an aging population (see our May 2011 publication entitled China’s long-term growth headwinds) and the prospect of reaching a “Lewis turning point”, where labour productivity falls because China is running out of cheap labour from the rural regions, which pushes up wages and gains from rising labour productivity falls. We believe that the Chinese leadership is well aware of these issues and are taking steps to address these one by one. Our base case calls for continued Chinese growth as it transforms itself from a growth model based on low cost-labour driven exports and infrastructure investment to one based on higher value-added exports and domestic consumer spending. In other words, expect the drivers of China's economic growth to change slowly over time, but growth will continue. What is admirable about Pettis' analysis is he goes into the implications of different policy options that the government has in order to effect these changes. As interesting as this long-term analysis is, my trader friends will ask me, "What's the trade?" When I talk to companies throughout China, there isn't a single one that's seeing an increase in profits or revenues. The winners of this transformation remains the commodity complex, as rising incomes mean greater resource intensity, and companies focused on the Chinese consumer. We would avoid companies and countries exporting capital goods to China. Japan, in particular, appears vulnerable over the next few years because of its high debt level and reliance on Chinese exports as a source of economic growth. A slowdown in China should not be viewed as a disaster, but an opportunity to buy into a secular growth theme at better prices. It's always good to have a long weekend once in a while as it gives me time to think and reflect, rather than to react in a knee-jerk fashion to news. So what to make of the shocker of a NFP release last Friday? Upon further consideration, it sounds bad as the stock market is caught by the dilemma where bad news is bad news and good news may be bad news. Why was employment rising so quickly? [T]he better jobs numbers seem somewhat out of sync with the overall pace of economic expansion. 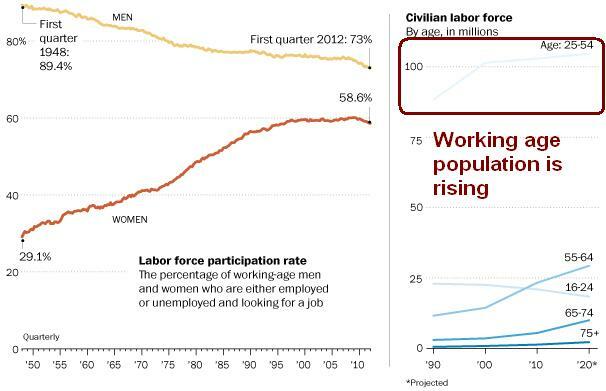 What explains this apparent discrepancy and what implications does it have for the future course of the labor market and the economy? Okun noted that, because of ongoing increases in the size of the labor force and in the level of productivity, real GDP growth close to the rate of growth of its potential is normally required just to hold the unemployment rate steady. To reduce the unemployment rate, therefore, the economy must grow at a pace above its potential. More specifically, according to currently accepted versions of Okun's law, to achieve a 1 percentage point decline in the unemployment rate in the course of a year, real GDP must grow approximately 2 percentage points faster than the rate of growth of potential GDP over that period. So, for illustration, if the potential rate of GDP growth is 2 percent, Okun's law says that GDP must grow at about a 4 percent rate for one year to achieve a 1 percentage point reduction in the rate of unemployment. [A]n examination of recent deviations from Okun's law suggests that the recent decline in the unemployment rate may reflect, at least in part, a reversal of the unusually large layoffs that occurred during late 2008 and over 2009. To the extent that this reversal has been completed, further significant improvements in the unemployment rate will likely require a more-rapid expansion of production and demand from consumers and businesses, a process that can be supported by continued accommodative policies. Stalling employment gains would provide fuel for policy doves (like Bernanke) within the FOMC for further rounds of QE. As I wrote before (see How easy is this Fed? ), the Fed is unlikely to have the political capital to engage in quantitative easing in the 2H as it is an election year. So will the data deteriorate fast enough to warrant QE? They are unlikely to act at the April meeting on a single month's data, especially when there is a 90% chance that the actual number lies between 20K and 220K. Doves will focus on the falling employment number, while hawks will focus on the falling UNemployment number. What if the next month's NFP came in around 150K? Will that be enough? I doubt it. A disappointing jobs report for those who expected the US economy was about to rocket forward, but one consistent with the slow and steady trend into which the US economy appears to have settled. And no reason to change the basic outlook for monetary policy - the Fed is on hold until the data breaks cleanly one direction or the other. The markets sold off last week when the FOMC minutes revealed that, while QE3 remained on the table, further rounds of QE are unlikely unless the economic data significantly deteriorates. For now, bad news (on employment) is bad news, unless it's really, really bad. [A]nother interpretation of the recent improvement is that it represents a catch-up from outsized job losses during and just after the recession. In 2008 and 2009, the decline in payrolls and the associated jump in unemployment were extraordinary...In other words, employers reduced their workforces at an unusually rapid rate near the business cycle trough--perhaps because they feared an even more severe contraction to come or, with credit availability sharply curtailed, they were trying to conserve available cash. In a way, Yardeni is implicitly endorsing this view of employment catch-up with his analysis of the jobs picture before the NFP release. This outlook is also consistent with Gallup's observation of falling unemployment, rising economic confidence and improving consumer spending. In addition, the Conference Board also reported that CEO hiring plans are rising. As we move into another Earnings Season, the interaction between employment and profits bear watching. Whether the inflection point for earnings to start rolling over happens this quarter or next quarter, I have no idea. I do, however, have a pretty good idea of the trajectory of the US corporate earnings for the rest of the year. Equity outlook: US likely to roll over, does it all depend on China? So there you have it. 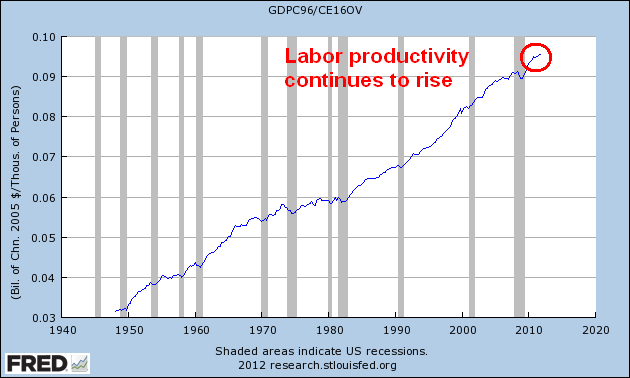 If we get good news on the labor front, it means a profit recession, which is bad for the stock market. If we bad news on employment, the Fed's hands are tied for the second half of 2012 unless the economy really craters. Looking ahead to 2013, we have the Bush era tax cuts expiring. With little agreement in Congress ahead of an election year, the US is likely to see rising fiscal drag in 2013. As we enter the second half of 2012, the markets will start to look forward and discount slower American growth, which would be negative for stock prices. The question is, why has that occurred amid a relatively weak global economy? And what could cause it to change? Inker believes the reversal of government budget deficits will kill margins. Profits have risen as corporations have successfully cut labor costs, but that was a short-term gain, Inker said. Normally, wage reductions and workforce cutbacks leave less money for consumers to spend across the whole economy. That didn’t happen over the last several years because the government stepped in with offsetting stimulus measures, allowing disposable income to remain high despite the fact that labor income has been shrinking. Today, US equities are the market leader based on a belief of an improving consumer (see This bull depends on the US consumer), Europe is starting to go sideways on concerns over Spain, Portugal, etc., and China is not showing strength. My Asset Inflation-Deflation Trend Model moved to a neutral reading early last week (see Time to take some risk off the table), which is the likely correct tactical response for now as the markets aren't in any imminent danger of tanking dramatically. Looking forward, however, the 12-month outlook for the US are faltering. There are a number of China bulls starting to come out of the woodwork (see example here), but I can see no technical turnaround in Chinese related markets for the moment. Under these circumstances, the bulls only hope are dependent on a revival of Chinese growth in the 2H, which is a risky bet on timing. While my inner trader isn't outright bearish, my inner investor tells me that selling in May is starting to sound good right now. President Nicolas Sarkozy put controlling the country’s public finances at the centre of his re-election campaign, saying France faced a “historic choice” if it wanted to avoid sliding into economic crisis like Spain or Greece. Unveiling a 32-point programme on Thursday that detailed tax and spending plans for the next five years, he promised to eliminate France’s chronic budget deficit in 2016 and return the country to a budget surplus in 2017 for the first time in more than 40 years. “The situation which our Spanish friends are experiencing, after what our Greek friends experienced, remind us of the realities,” he added. In concert with his economic focus, Sarkozy released a 34 page manifesto that told French citizens the way it is, with little sugar coating. En 2011 enfin, la crise de la dette des Etats a failli faire disparaître l’euro. L’euro n’a pas tenu toutes ses promesses, c’est un fait, mais rien n’aurait été pire que son implosion. C’eût été le saut dans l’inconnu, l’Europe divisée, de nombreuses banques en faillite, des millions d’épargnants cherchant à retirer leurs liquidités, les Etats, dont la France, obligés d’emprunter à des taux rédhibitoires, et de réduire en conséquence leurs dépenses de façon brutale tout en augmentant lourdement les impôts. Finally in 2011, the debt crisis of the States has threatened the existence of the euro. The euro has not kept its promises, it is a fact, but nothing was worse than his implosion. It would have been jumping into the unknown, Europe divided, many failed banks, millions of investors seeking to withdraw their cash, states, including France, forced to borrow at prohibitive rates, and consequently reduce their costs while increasing brutally heavy taxes. The recession would have been even greater violence. That's why I did everything to save the euro and to save Greece. Greece only let out of the euro, it was admitting the reversibility of the single currency. Why not then Italy, Spain, Portugal? It would have been to risk a dangerous contagion. L’Allemagne est le pays auquel l’implosion de l’euro aurait causé le moins de problèmes. Elle s’est conduite en alliée pour sauver notre monnaie commune. En même temps, la France a obtenu une réforme de la zone euro pour que les errements du passé ne se reproduisent pas : le gouvernement économique de la zone euro que je réclamais depuis des années est désormais en place et la convergence des politiques économiques est engagée. Germany is the country to which the implosion of the euro would cause the least problems. She was driving an ally to save our common currency. At the same time, France was awarded a reform of the euro area so that past mistakes are not repeated: the economic government of the euro area that I claimed for years is now in place and convergence of economic policies is engaged. Tout cela a été très difficile. Nous étions au bord du gouffre. Croire dans une réouverture des négociations est une utopie tout simplement parce que celles-ci viennent de s’achever et que pas un gouvernement en place en Europe ne le souhaite. Avec le sauvetage de la Grèce, la réforme de la zone euro vient en outre d’enregistrer son premier succès majeur. Cela n’a donc rien à voir avec la réforme de la zone Schengen que je propose, dont le traité fondateur date de 1985 et dont les insuffisances sont criantes. Cette réforme est au surplus souhaitée par un nombre croissant d’Etats. All this was very difficult. We were on the brink. Believe in a reopening of negotiations is a utopia simply because they have just been completed and that no government in place in Europe wants. With the rescue of Greece, the reform of the euro area has also recorded his first major success. This has nothing to do with the reform of the Schengen area that I propose, whose founding treaty in 1985 and whose weaknesses are glaring. This reform is moreover desired by a growing number of states. Sarkozy is, in effect, following the Grand Plan laid out by the eurocrats as outlined in the interview by Mario Draghi by dragging the French screaming and kicking into a market based reality. The Grand Plan calls for "good austerity" in the form of tax cuts and government cutbacks, along with structural reform that does away with the European social model. Will Sarkozy's approach of giving the unvarnished truth to the French electorate work? Bloomberg reports that a recent poll shows that he is narrowing the lead on Hollande. Even though his socialist challenger is in the lead, Sarkozy has shown himself to be a formidable campaigner. Hollande is being pulled to the left with his proposals to raise the top marginal tax rate and to lower the retirement age back to 60 from 62, which may hurt him. While the markets may not react well to a Hollande win, all is not lost. The new president will have to deal with the bond market vigilantes, who will be out in force shortly after the election. No doubt Merkel and the Germans would prefer to deal with Sarkozy because he is the devil they know, Hollande has also shown himself to be European in outlook and he is committed to the European Union and understands the consequences of a eurozone breakup. If he were to get elected, we will no doubt seem some back-and-forth which leads to a watered version Grand Plan 2.0, but Europe is likely to continue to proceed down the reform path. After turning neutral in January and then bullish in early February, the Asset Inflation-Deflation Trend Model has moved back to a neutral position, indicating that my model portfolio should take some risk off the table. To give more color to the change, consider the view from the three Axis of Growth, namely China, Europe and the United States. I would characterize the outlook for China as the most cautious; Europe as moving from bullish to greater uncertainty; and the US as experiencing slow and steady growth. As regular readers know, the Trend Model relies primarily on commodity prices as an indicator of global growth and inflationary expectations. Commodity prices have been rolling over, as shown by the chart of the CRB Index below. The commodity complex is highly sensitive to Chinese growth and there have been much concern about the near term trajectory of China's growth outlook. Indeed, a glance at the Shanghai Composite confirms the level of investor nervousness as that index as moved into a minor downtrend. Next in Hong Kong, the Hang Seng Index has confirmed the weakness observed elsewhere as that index is in the process of breaking a key technical support level. Similarly, the commodity and Chinese growth sensitive Australian Dollar is in a downtrend, indicating weakness. I could go on, but you get the idea about the market judgement of China's near-term growth outlook. In Europe, the ECB's action through the use of LTRO has removed the immediate threat of a banking meltdown. As a result, the markets have enjoyed a relief rally that began late last year. In the short term, however, much of the good news appears to have been priced into equities. As I indicated last week (see Europe takes one step back? ), worries about Spain are beginning to surface and the normal back-and-forth negotiations are showing up on the stage of European Theatre. The latest act is now beginning to spook investors. The European equity indices have broken down out of the uptrend that began late last year and appear to be consolidating sideways. Note that this is not necessarily bearish, but a sign that the markets need to either correct or digest its gains from last winter. Other signs of stress are showing up in Europe. The chart below shows the relative performance of European Financials against the market. After rallying through a relative downtrend in January, which would indicate that a Crash is off the table because of ECB support, the sector began to consolidate sideways. Most recently, the Financials exhibited a relative technical breakdown, which is a sign that the market believes that financial stress is rising again. Across the Atlantic, US equities continue to hum along and grind upward in a steady and well-defined uptrend. I pointed out that the health of this bull has changed from being dependent on central bank liquidity to one that depends on the American consumer (see This bull depends on the US consumer). The chart of Consumer Discretionary stocks relative to the market shows that this sector remains the market leaders - and the health of this bull depends on the American consumer. Putting it all together, I interpret the model readings as telling that of the three regions, one is strong (US), one is consolidating (Europe) and the third is weak (China). This is not a sign to panic, but to become more neutral in your asset allocation and risk budgeting decisions. Within the riskier portions of the portfolio, I would be inclined to tactically tilt towards US and US Dollar denominated asset classes.